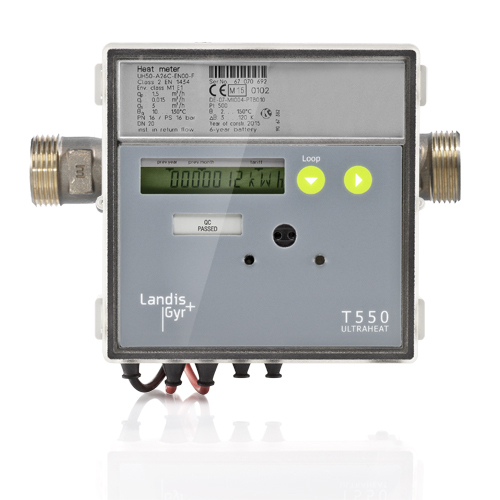 The Landis+Gyr ULTRAHEAT®T550 (UH50…) heat, cooling or combined heat/cooling meter has been designed specifically for the varied applications of heat and cold measurement: It meets the special requirements of district heating and cooling, local heat and building installation. Whether for a detached house, apartment building or special tariff customer – the dimension and the specific scope of the T550 are always right. Modularity and flexibility of individual software settings permit ideal adaption to your requirements and applications. At the T550 (UH50…) flow rate measurement occurs without mechanicals moving parts according to the non-wearing ultrasonic method. The full-metal design is robust and durable and needs no straight pipe sections. This saves space and costs. With the innovative DuraSurface™, the T550 (UH50…) is setting new standards in measurement stability. For this purpose, volume measuring units up to qp 2.5 are fitted with the special internal profile. DuraSurface™ ensures that interfering out from the outset. That makes the meter more resistant to dirt deposits. This future-oriented innovation ensures measuring accuracy and maintenance-free operation for many years. A security package enables early detection of tampering and possible problems with the system. So the T550 (UH50…) records and signals incipient soil in the system and offers effective tampering detection on the temperature sensors. The undeletable logbook as a standard feature rounds off this function perfectly. Monthly values also make consumption and measurement values plausible and traceable. A wide and constantly expanding range of communication modules makes the ULTRAHEAT T550 (UH50…) future-proof. Two serial slots allow using parallel communication ways. A standard optical interface allows reading out consumption values over a hand-held terminal and enables a smooth integration in different systems.